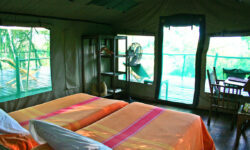 This is a camp with a location so fantastic that there is little incentive to go elsewhere for safari action. 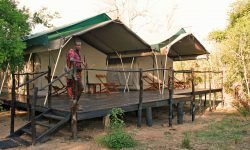 Built on the banks of the Rufiji River this stylish yet relaxed tented camp offers the discerning traveller a great setting for a memorable holiday. There are just 8 tents, making this one of the least overcrowded of bush camps. 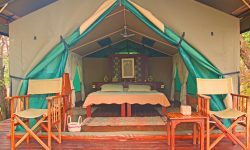 Each spacious tent, set on a wooden platform, has a veranda looking over the river or lagoon and all are set well apart giving seclusion and privacy. There are two family tents; these consist of two tents on one platform, each with its own bathroom. The dining room is raised for optimum views of Africa’s greatest show. 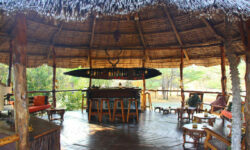 Superb food and a well stocked bar all complement the experience. Game drives are in 4 WD Landrucisers with bucket seats; we take max 4 people per car, with a driver and guide. Bush breakfasts and picnics are popularly combined with boating and walking safaris, followed by a cool swim in the clear blue pool. Flexibility is key. Guests can take an all-day game drive with picnic, or a game drive in the morning and a boat safari in the evening (or vice versa) or a morning game drive followed by lunch in camp, a short nap in the heat of the day and an evening game drive.